Home Tags Posts tagged with "coca-cola factory"
June Shannon came under fire for giving her daughter Go-Go-Juice, a mixture of Mountain Dew and Red Bull, before little Honey Boo Boo took to the stage in pageants. Yet the mother-of-four thought it wise to take seven-year-old Alana “Honey Boo Boo” Thompson to the Coca-Cola factory in Atlanta, Georgia, for a family day out instead of somewhere educational. 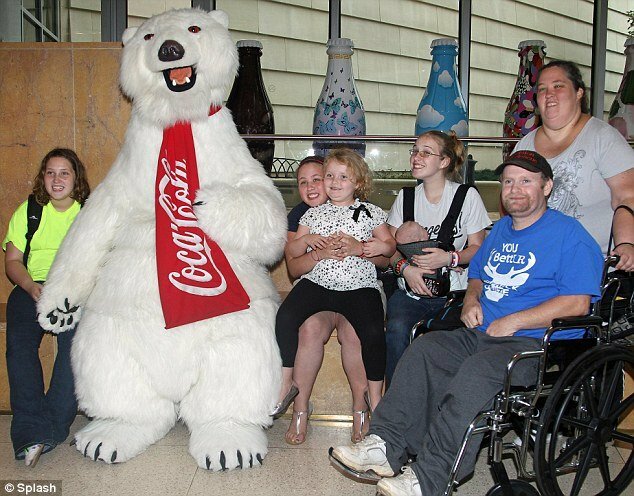 The whole gang – including Honey Boo Boo’s half-sisters Lauryn, Anna and Jessica, and her father Mike “Sugar Bear” Thompson – were spotted as they took photographs with Coca-Cola’s iconic polar bear. They also took the factory tour, watched a 3D movie on the secret ingredient, posed by the famous American Idol chair, and tasted different varieties of the carbonated drink from across the globe. Honey Boo Boo initially found fame on Toddlers & Tiaras before landing her own self-titled spin-off show on TLC, Here Comes Honey Boo Boo. She was seen confidently playing around the tourist spot, dressed appropriately in black leggings and a white blouse with stars speckled on it – instead of garish pageant clothes. Even Honey Boo Boo’s newborn niece Kaitlyn went along for the ride, strapped to her mother Anna. The last episode of Here Comes Honey Boo Boo, which aired at the end of September, saw the 17-year-old single mother give birth during the season finale. Meanwhile, Honey Boo Boo played the devoted daughter, pushing her father around in his wheelchair. Sugar Bear recently spent 12 days in hospital following emergency surgery to fix a leg infection. In other news on the loveable rogues, TMZ have reported that TLC boosted the family’s salary from approximately $5,000 per episode, to a sky-high $20,000 after seeing the success of the series.